Baba Ghanoush is the less glorified cousin to hummus. It’s creamy and scoopable with nearly any form of chip, bread or vegetable … and healthy to boot! It feels more special than hummus, perhaps because it’s less abundant at the supermarket, but it’s made with the same ingredients save for one shining star: the eggplant. Seriously, it’s a matter of swapping chickpeas for eggplant, and voila! I’ve found that even though this dip might be obscure to some people, it is loved by all! Bobby’s aunt and I created a new tradition to ring in the holidays on December 24th. Every year we cook a feast from a different country. Last year we chose Turkey, for which baba ghanoush had its place at the table. The dip was gone in seconds, lathered on pita, dressed with feta and olives and made hearty with Lamb Kofta. But of course, the best time of year to make baba ghanoush is right NOW, when eggplant are fresh and plentiful from the fields! With fresh eggplant you also avoid the common trap of a “bitter eggplant,” which is more likely to happen when it’s been sitting in the produce section for too long. Although, when I teamed up with Tracy at Early Morning Farm to make this recipe, we both agreed that being burned by a bitter eggplant is worse than taking the time to salt it and drain out the bitterness – fresh or not. But there is one mystical exception to the rule: baba ghanoush. In this video, we share a step-by-step tutorial for making baba ghanoush. Since it’s summer, we’re encouraging you to cook your baba ghanoush on the grill (or over a gas stove if you have one). The smoky flavor takes this dish to a whole new level. I’ve also included instructions for cooking your eggplant in the oven if you do find yourself craving this dish in the winter. In this video you’ll also find recipes for Eggplant Parsley Stir-Fry, Grilled Eggplant, tips for shopping for eggplant and tips for preparing eggplant. We’ll also show you how it’s grown at Early Morning Farm and the varieties CSA members can expect to get in their box. Dig in! This recipe is adapted from Early Morning Farm. To finish baba ghanoush, I like to drizzle olive oil over the surface and sprinkle smoked paprika and minced parsley on top. Not only does it add a pop of color, but a symphony of flavors with each bite. Preheat the oven to 375 F and line a baking sheet with foil. Turn your grill or gas stovetop to medium-high (see below for making baba ghanoush in the oven). Place the eggplant over the flame and allow to cook, rotating the eggplant to full char the outer skin. When the eggplant is extremely soft to the touch, remove from the heat. Slice the eggplant in half. It may be fully cooked through. If the center is still a firm to the touch, place the eggplant halves flesh-side down on the baking sheet, and bake for 15-25 minutes. The inside should be very soft and mushy. Peel the skin or just scoop the flesh into a food processor or blender. Add the tahini, garlic cloves, lemon juice and sea salt and blend into a puree. While blending, drizzle in the 1/4 cup of olive oil. 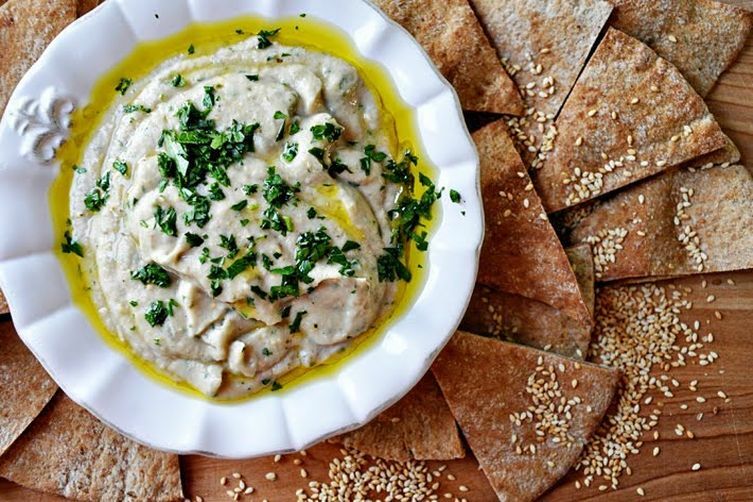 The baba ghanoush will come together in a creamy, thick consistency. I like to leave a bit of chunky texture sometimes too. Transfer the baba ghanoush into a serving dish and drizzle the remaining olive oil on top. Garnish with them minced parsley and smoked paprika. If you are making baba ghanoush without a grill or gas stovetop, you can use your oven. Preheat the oven to 375 F and line a baking sheet with foil. Prick the skin of the eggplant with a fork so the entire eggplant is pocked with holes - this will help steam release in the oven. Cut the eggplant in half and place it on the baking sheet flesh-side down. Bake for 30-45 minutes (or longer), until the inside flesh is extremely soft to the touch.